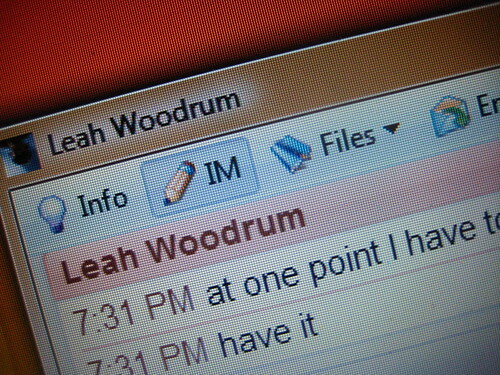 I talked to Leah!, originally uploaded by tara.aukerman. I finally got to talk to Leah! I spend so much time thinking and saying, “I wish Leah were here” or “Leah would SO get a kick out of this” that I almost feel like I talk to her often. Almost. Tonight I really got to talk to her. — Telling us how women play rugby, too, but that they have to be very strong. — Getting ready to tell us about something exciting that happened today. — The response to my suggestion that she take pictures of the house she’s living in so that later she’ll be able to remember all the details. — The next time we get to talk to her online.